The London Planetree is a hybrid cross between sycamore (Platanus occidentalis) and oriental planetree (Platanus orientalis). This very popular shade tree was planted extensively throughout Europe because it is very tolerant of urban conditions. It became know as the London Planetree because of its popularity in London, England. Growth habit As a young tree it is pyramidal in form giving way to a round habit at maturity. At maturity it can be over 100 feet tall with an 80 to 90 foot spread. 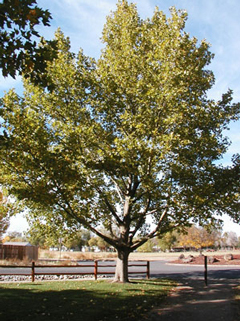 This large shade tree requires a lot of room and is best suited for parks, golf courses or open spaces. 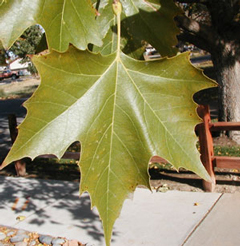 Foliage The large, maple-shape leaf usually has five coarsely toothed lobes. Color is a lustrous bright to deep green. Fruit Male and female flowers are inconspicuous and borne on the same tree. The fruit is a bristly ball on a 2 to 4 inch stalk in late summer. 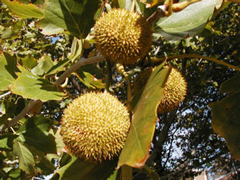 This fruit can be either single or in pairs, which sets it apart from the American sycamore (Platanus occidentalis). The fruit hangs on the tree into winter. Bark This tree is extremely attractive in the winter months with its patchy olive-green, creamy-yellow and light tan bark. The light brown bark also exfoliates revealing the colorful patterns, which lie underneath. Insects and diseases This tree is a better choice than the standard American sycamore for its overall beauty and resistance to sycamore anthracnose. In a cool, wet spring sycamore anthracnose can reproduce rapidly causing the death of the small branches in the outer crown on American sycamore. 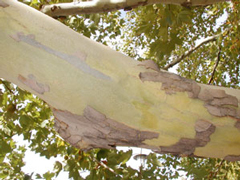 Although it is not fatal it can make the tree very unsightly, which means one should choose a sycamore anthracnose resistant variety. 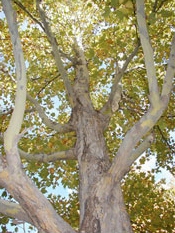 London planetree cultivars are resistant to sycamore anthracnose. Aphids can be a minor problem to the foliage. Landscape value The tree prefers rich, moist, well-drained soils but is surprisingly tolerant of just the opposite. It can be planted in dry, clayey and alkaline soils. It also will tolerate hot dry climates. The tree is very tolerant of heavy pruning, which makes it a great candidate for the practice of pollarding. There are at least two cultivars available in Colorado: Bloodgood and Yarwood.